This is a very polarizing issue on bass forums and has been for many years, matched only by the great “pick vs. fingers” debate, or thumb-down vs. thumb-up for slapping. I hope I can not only shed light on the issue of which technique you “should” know, but also help you move out of the dogmatic right/wrong thinking that plagues beginning and intermediate bassists, and move into the pro mindset of using techniques as a means to a musical end. It’s important at the beginning of any discussion to define our terms. Otherwise when I say “floating thumb,” you may think I mean something other than what I actually mean, and our discussion will go nowhere fast. Debates on right thumb technique rage on on bass forums in part for this very reason – people are unclear about what technique they’re referring to with the language they use. Thumb rests on the pickup while playing the lowest pitched string, moves up to low string when playing other strings, sometimes even further depending on personal preference. The thumb rests on the pickup no matter which strings are being played. The right thumb doesn’t touch the strings or pickup at all. Either the arm is free-floating or the forearm is anchored on the bass. I go into detail on the moveable anchor technique in this video, where I’ll cover the basics for beginners and then get into more nuances for intermediate and advanced players. I notice some slight variations among famous bassists using this technique, mostly with when they choose to move their moveable anchor (thumb). For example, one pro bassist might be 50% more likely than another to shift the thumb to the E string during an extended passage that doesn’t use the E string. Or they might leave the thumb on the pickup for that passage if they’ll be coming back to the E string in a bar or two anyway. I also notice that some bass players (like myself) will move their thumb as far as the A string if a passage uses only the D and G strings, while others use only the pickup or the E string as an anchor point. What I don’t see is professionals using the static anchor technique, where the thumb is always on the pickup and never moves to the low E string. Anchoring the right thumb on the E string when it’s not in use is an easy way to mute your fattest, most ring-prone string, so I can see why it’s hard to find the static anchor technique actually in use by a popular bass players. So in the quest for an optimal right-thumb technique that provides stability and help with muting, I think we can throw static anchor and floating hand out of the discussion, and focus on moveable anchor and floating thumb. Moveable anchor is the technique that I most use and that I’ve taught my students for years. I’ll do my best to draw on objective data points and take a clear look at the pros and cons of each technique, but my take on this issue will of course be colored by my personal background (as will anyone else’s) … hopefully not too much for you to benefit from this exploration. 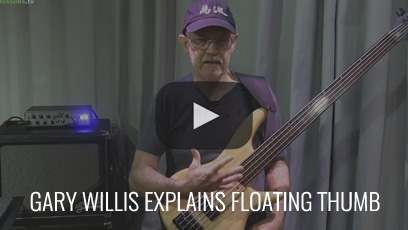 The floating thumb was developed by Gary Willis, who has said himself “it is unique, it’s kind of different” So let’s start this showdown with a clear picture: all of the bassists listed above use moveable anchor, while floating thumb is use is rare. In fact, I could manage to find only one other bassist using Willis’s technique (Kai Eckhardt, co-founder of Garaj Mahal; I also love his playing on Curandero’s album Aras). But Eckhardt sometimes uses only the floating thumb, and other times uses the moveable anchor. I don’t mean to totally discount the floating thumb—just because most people do something doesn’t necessarily mean it’s better—but I do think it’s important to note that the “most people” we’re discussing here are all our favorite legendary bass players. So what are the benefits of Gary Willis’s approach? One big advantage is less wrist angle than is commonly found with the moveable anchor. Using the floating thumb naturally puts your right wrist at almost no angle, which reduces the risk of having pain and tension in the right hand (and even carpal tunnel syndrome down the road). However, this is not the only way to reduce wrist angle. There’s a lot you can do with your right arm placement to reduce wrist angle with the moveable anchor technique. And in my mind, some wrist bend is allowable. There’s a big difference between 15 degrees and 80 degrees of bend. In the ongoing discussions on this topic, a lot of people seem to have the viewpoint that moveable anchor will give you carpal tunnel syndrome. Hopefully we can put that incorrect notion to rest by noting the possible adjustments (move shoulder/elbow/thumb angle around to reduce wrist angle), and also by looking at bass players who’ve made a career out of moveable anchor for many decades, like Lee Sklar or Nathan East. Those guys are two of the most recorded bassists of all time, and I think they would have noticed a fundamental problem with moveable anchor by now, if one existed. A few aspects of the floating thumb make it unsuitable (to me) to be crowned as the new standard of bass technique. I’m a big fan of using a light touch—sometimes. For me, as a musician who goes from a sit-down-and-play jazz casual on Thursday night to a run-around-like-a-madman rock gig Friday night, using a light touch isn’t suitable as an all-the-time rule. For me (again, being biased by my background with the moveable anchor), it’s harder to get the big, aggressive plucks that I need using the plucking angle of the floating thumb technique. I can see using it on a chill blues gig, but definitely not for my rock star moments. It’s not just about getting more volume, which you could do by turning up your amp. Plucking hard gets a different intensity and tone, which is crucial for getting the right rock sound. If you watch any famous rock or metal bassist who plays fingerstyle up close, you’ll see them attacking their strings really really hard. And they’ll be using the moveable anchor when they do it. Rob Trujillo is a classic example of this. Another thing the floating thumb that doesn’t work for me is that it feels less flexible for switching to slapping or tapping in the middle of a song (techniques that Gary Willis doesn’t use, to my knowledge). Again, I may be showing my bias here because I have years of practice switching from moveable anchor to slap and back. However, just looking at the physical moves, my elbow position for moveable anchor tends to be a little lower than it is for the floating thumb, and I want my elbow low for slapping, so it requires less motion to get from one to the other. My final concern with the floating thumb is about string crossing. The moveable anchor allows you to hover your hand over the strings, making it really easy to do big string jumps without too much arm movement. The floating thumb instead positions your hand next to the strings, so you have to slide your whole arm down to get from the E string to the G string. Gary Willis, in addition to his floating thumb, uses a three-finger plucking technique (two fingers being the norm). This has the effect of substantially increasing reach, because the ring finger is farther down the hand. My concern is that without also learning a three-finger plucking technique, it could be hard to do large string jumps, especially if a bass line is going back and forth quickly, say from the E to the G string, and especially if you have small hands. If you’re a beginner: Learn moveable anchor. 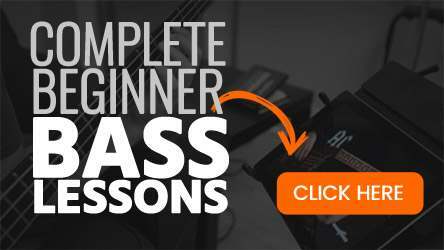 It’s the simplest to learn, most of your favorite bassists use it, and you can always learn other techniques later if you want to. If you’re already doing moveable anchor: As long as you’re being mindful with your wrist angle, are pain-free, and getting the musical results you want, keep on trucking. If you’re doing floating thumb and you love it: Keep doing it. 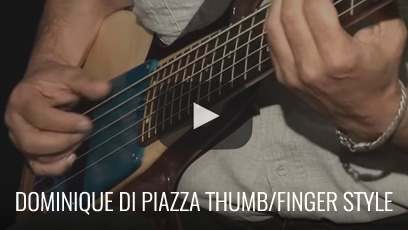 Dominique Di Piazza shreds with some really interesting thumb and finger-plucking patterns. 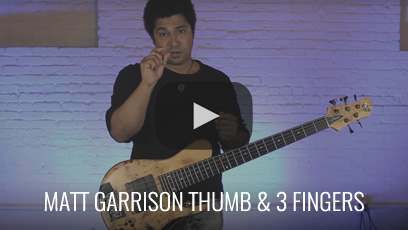 Matt Garrison created a technique alternating the thumb and three fingers (ring-middle-index). Billy Sheehan sometimes does 4-finger alternating! So why are we talking only about Gary Willis? I would guess it’s not because his technique is superior to others I’ve mentioned, but because he’s been particularly vocal as a bass instructor for many years. All that said, there’s no reason you have to learn only one of these techniques, or that you have to stick to the same technique for a whole gig or even a whole song. I personally float around between normal (moveable anchor) plucking, thumb plucking, thumb-and-fingers plucking, and maybe even some floating hand, depending on the gig, how much I’m moving around on stage, and how goofy I’m being as a showman. Not to mention slapping, strumming, tapping, and more. For me, it really gets silly to try to assert that one technique is “right.” There are just too many possible variations, both with technique (number of plucking fingers, wrist angle, shoulder angle, elbow placement, strap height) and players (body size and shape, arm length, finger length). However advanced your bass playing is, you can start talking like a pro bassist by letting go of the notion of right and wrong techniques. Pro bass players use the techniques that work for them; they don’t use them because they’re “right.” Pro bassists use technique functionally to get musical results, rather than trying to satisfy an arbitrary conception of how they “should” play. A “good/right” technique is the one that gets you the musical results you need without causing pain or unnecessary tension. Even if you disagree with my personal recommendation that beginners learn the moveable anchor technique, I hope you can see that there’s no universal right and wrong answer here. Everyone has unique musical voices and goals, a different body, different styles of music they want to play, and different ways they want to approach the bass. Technique is a tool, and the moveable anchor is one tool that will get pretty much any job done. It’s versatile, relatively simple to learn, and chances are your all-time favorite bass player is using it right now. Hey Keith, Steve does have a quirky RH angle, but it still looks like a thumb anchor to me, just using the side of his thumb, probably because he slings his bass pretty low. I’m trying to find footage of him playing up close to tell for sure, but unsuccessful so far. Do you have anything?